After opening your business bank account (and getting a debit card), you may also want to get a credit card for your LLC. Business credit cards offer more rewards than just a debit card, such as cashback and travel. Getting a business credit card also help builds your LLC’s credit history, which is separate from your own personal credit. 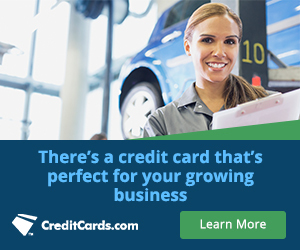 We recommend using CreditCards.com to compare the latest business credit cards. Can a foreigner apply for an LLC credit card? Hi Frank, I believe so, but not 100% sure. I think you’ll need an ITIN (Individual Taxpayer Identification Number). I think there are companies that help foreigners build credit history, but I don’t know anything about this space yet. Proceed with caution though as their could be some shady companies out there. I’d say the best way to go about it is open a business account and a personal account at the bank (in the state where you for your LLC). Then after you establish some history with them, visit the brach in person and ask about obtaining a credit card. Hope that helps. Feel free to keep me posted. I’m curious to hear what you come with. Great website. Thank you very much! My question is if in there was no operating agreement because when the LLC formed is was only one person. But in the taxes my husband added him self as 50% of ownership would I have to make him sign a withdraw document? Hi Delores, thanks so much! A situation like this is much better presented to an attorney. It’s not something we can get into as there are a handful of additional details and nuances that would need to be uncovered. Thanks for your understanding. Hi Kenny, you’ll want to review the Operating Agreement to check procedure for adding an LLC Member. Usually it goes as follows: review Operating Agreement, prepare Assignment of Membership Interest Agreement, amend Operating Agreement, amend Articles of Organization (if applicable), notify IRS if change in tax classification, update state Department of Revenue, and update bank. Hope that helps. My personal credit stinks are there secured business credit cards i can apply for i have a LLC for real estate? Hi Derek, we’re not sure, but you can call a few credit card companies and ask or browse through creditcards.com. Hope that helps. Is it set in stone that to get credit cards for the Business that your personal SSN is required??? Hi Durrell, I’ve never seen it any other way. I just opened a single member LLC. I’ve been opening up several accounts such as at NAPA, COOP, and a business fuel card. I supply my EIN number but they are all pulling my personal credit report to make the decision. They are also requiring my SS number with an LLC. Why is this happening? I also forgot to tell you that on all the LLC application for credit at the bottom they ask for who is making this request and require my SS number and who will be responsible for this debt and they require my personal SS number then they pull my personal credit. Even though on the application I supplied my EIN number. Hi Dustin, that’s the way it is when I get credit cards for my LLC. The “industry” you’re referring to is about building business credit and it’s not something we get involved in, either by taking actions ourselves or writing about it. And frankly, it’s a pretty shady space with questionable tactics. Be careful with the information you consume. Hope that helps and thanks for understanding. Thanks for responding back and answering my question. Best website I ever met. Very informative and generous.